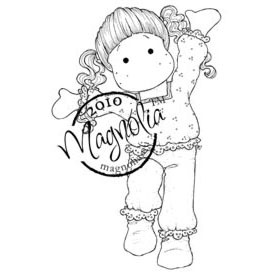 Magnolia "Raising the Ceiling" stamps are in! Yay! Jump on over to The Beary Scrap quickly to take advantage of the pre-order sale price *and* get immediate shipping! How great is that?! Hello friends! Today I'd like to share an Appletini with you. *wink* I colored this image last week and just wasn't inspired by any papers in my stash, so I set it aside. Yesterday, as I was eyeing up my design team goodies from The Beary Scrap I had an "Ah ha!" moment. This sassy image pops on my fab new Basic Grey Origins paper. 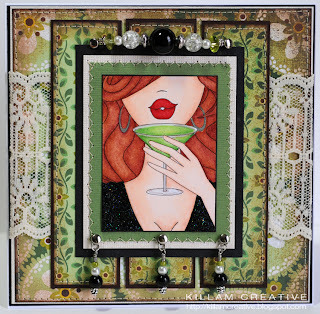 I used black Stickles on her dress and Glossy Accents on the glass and her lips. Oh, and that deliciously wide lace is from Grandma's stash. Thanks Grandma! Cuttlebug Challenges - Stitch It! Corrosive #51 - Sew It Up! Fussy and Fancy #4 - Dazzle Us! Thanks for stopping in! I'd love to hear your thoughts about this project. Don't forget we're *this* close to the official launch of The Beary Scrap Design Team Blog! 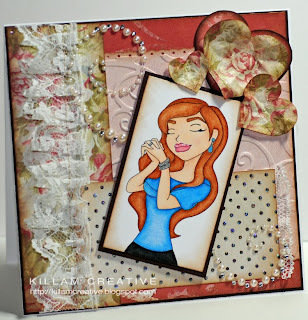 Join us Monday, March 1 for kickoff blog candy, our weekly theme announcement and our first DT project post by the oh-so-talented Gini Cagle (Beadz). Whoo hoo! Hellohellohello! It's Friday, so that must mean it's Sassy Studio Designs time! 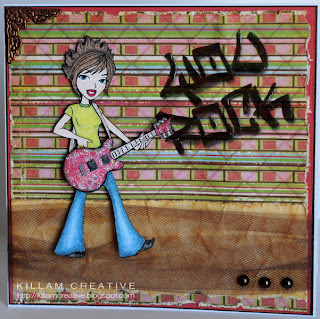 Today I have a little rock-n-rolla for ya. This is Rockin' Roxie, and she spray painted the walls for you! I was looking for a grungy feel - crumpled up the yellow paper at the bottom and inked the creases. Both the brick wall and the yellow papers were distressed with scissors (def. need to find a real distresser!) and wrapped with Bazzill tulle (found here). 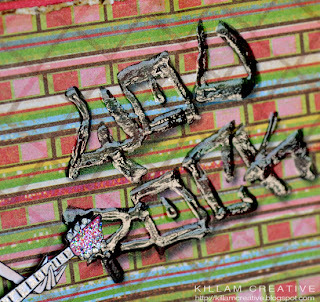 The graffiti is printed directly onto the paper and enhanced with Glossy Accents. My last two cards posted seem to be wildly different from the type of card I *want* to make... I really need to pull out the lace and flowers! Thanks for stopping in - have a great weekend! Hello friends! Today Sassy Studio Designs would like you to join us for A Walk Down Sassy Lane. Lindsay keeps all the SSD fans stocked with great new images each month, and right now we'd like to celebrate a few that have been around for a while. The design team dusted off a few old favorites and gave them new paper and embellies! Won't you hop along and visit with us? What never gets "old" is freebies! Make sure you comment at each blog stop, and when you return to the SSD blog include your email in the comment and Lindsay will send you a surprise! Hurry, this expires at Midnight PST. Speaking of surprises, there's a whopper of a treat for us on SSD at 5pm PST! See you there! Ok, so I ran across a note about a blog hop/release happening either this weekend or Monday. It was BIG and made me tingle with excitement. 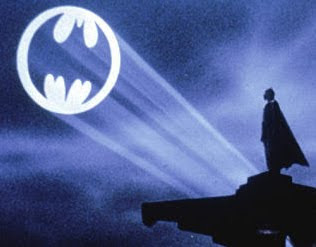 Unfortunately, my forty-something brain forgot *where* it is, so I'm sending out the bat signal for help. Do you know of a blog hop going on this weekend? Please let me know - it just might be the thing that makes me tingle again! Thanks so much dear friends. SSD Dare To Be Sassy Challenge! Hiya friends! The snow just keeps coming here in Maryland. Living near the beach, I guess I should just imagine it's a whole lotta white sand, right? Can't quite figure out the sand in the trees, though... haha! 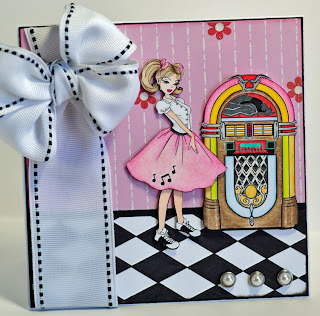 It's Dare to be Sassy Thursday, and today I have a Sassy Studio Design DT card for you. If you take on our challenge to make a project with a Sassy image, 3 hearts and loads of bling, you could win 2 Sassy Studio Designs images! Deadline to enter is 2/17, so hurry up and get Sassy! I really like the effect on the hearts. The pink paper is embossed with a Cuttlebug folder and spritzed with the same pearl Glimmer Mist. The polka dot paper is studded with sparkly Stickles. Fussy and Fancy - Hearts! 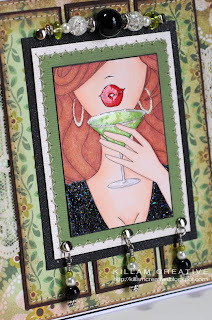 Michelle Perkett Studio Blog Hop! Hello everyone! Phew! The storm got the better of us for a while, but here I am - finally! Thanks for stopping in, and for hopping along with us. If you've come from the lovely Ileana's blog, you're right on track! 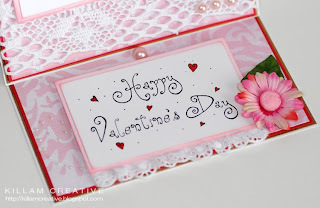 The Michelle Perkett Studio Blog Hop is all about love, and we're here to share a love letter with you. I've written mine to Grandma. Here's my card, which gets dropped in the mail to Grandma this week. This is my first easel card, and I love it! I hope you do, too. The Beary Scrap Design Team Call! Hiya friends, thanks for popping in today! While I work on my Michelle Perkett Studio blog hop project, I thought I'd let you know about my very special friend Kimm and her Design Team Call! First, let me tell you a little about Kimm's store. The Beary Scrap is a brick-and-mortar (in Shavertown, PA) and online shop that sells great papers like Basic Grey, Bazzill, Flair Designs, Kaisercraft, Little Yellow Bicycle, Cosmo Cricket, Dream Street and loads more. 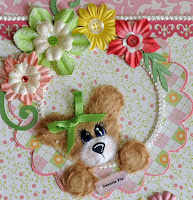 You'll find tons of fun embellishments including Flower Soft, Bo Bunny, Prima and Doodlebug. She carries great mediums including Copics, Tim Holtz Distress inks, Glimmer Mist, Stickles and Colorbox Chalk inks. 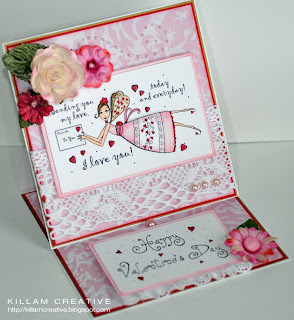 Kraftin'Kimmie and Stampavie Stamps are in the house, as well as Spellbinders. You'll also find adhesives like Scor-Tape and Glue Glider, as well as everything you will need to make the adorable and very popular Tear Bears. Kimm at The Beary Scrap taught me how to make these adorable bears and has tons of supplies and freebies to help you out, too. Nowadays, she has acrylic patterns to help make the project easier, and even has a Tear Dog called Oliver. He's too cute! So, on to the Design Team Call! Entry deadline has been extended through Saturday, February 6th. The new design Team will be announced Monday, February 8th, and the 6-month term begins March 1st. Please go to The Beary Scrap Blog for all the details and submission how-to. There is a monthly store voucher *and* a store discount for other purchases. 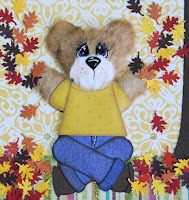 You will need to make 4 projects monthly for the Design Team Blog that includes supplies from The Beary Scrap, as well as participate in and promote TBS store events, contests, blog hops, and challenges on your blog. You're already creating awesomeness, why not do it with TBS? Read *all* the deets at the blog, and get your submission to Kimm by Saturday night! Now, do you want to come play with us at the Alice in Sassyland release party? Tonight between 5pm and 7pm PST (that's 8pm-10pm for those of us on the East Coast) at our party blog we'll be playing Sassy Bingo! If you want to play along and didn't sign up yet, run on over to the Sassy Studio Designs blog and sign up *before* 5pm PST, and we'll email you a Bingo Card. (I know, I know, the deadline has passed, but the more the merrier!) We'll be playing 2 bingo games with 4 winners - come join us! For full details *and* the location of the Sassy Party Blog, go here. Details are up now, and Jacquie will post the party blog address just before party time! 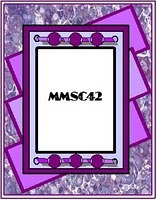 For my card, I've used Sassy Cheshire Cat. Meow! I've modeled her after the teal Cheshire Cat in Tim Burton's Alice In Wonderland, in theaters soon! A Spoonful of Sugar - Freestyle! Your Next Stamp - Anything That Sparkles!